There’s no doubt Tassort established exactly where the bar sits at this stage for the 2019 Golden Slipper after his stunning debut win at Rosehill Gardens. Using the Punters Intel data, and third-placed Jonah as a reference, let’s take a look at Tassort in comparison to the unbeaten Time To Reign who won over the Rosehill 1100m on November 3. Jonah was runner-up in that race, beaten three-quarters of a length, in a time of 1:04.90 on a Good 4 track. On Saturday, Tassort clocked 1:03.88 and Jonah himself ran 1:04.80 also on a Good 4. While the two races were on different days they were run in relatively similar conditions and the difference in time equates to around six lengths. Time To Reign led all the win in his latest win, running 34.77 for his last 600m. He ran 8.23 for the first 100m, then 10.61, 11.22, 11.47, 11.52 and 11.78 for his last 200m. Spaceboy led Saturday’s contest at a much stronger clip going out in 8.00 the first 100m then 10.54, 11.27, 11.36 and 11.19 before Tassort hit the front. Tassort’s individual splits were 8.22, 10.56, 11.26, 11.41, 10.96 and 11.38 with his last 600m 33.75, 0.77 faster than any of the three rivals. No wonder he’s now a dominant Golden Slipper favourite four months out from the race. Can he reproduce it, or improve on that base, in the autumn and can his peers to catch up? Promising colt Napoleon Solo proved a three-year-old can get the better of the older horses in the spring as he overcame a flat spot to win one of the 1500m Benchmark 78 events. His data shows he wasn’t able to quicken significantly from the 600m-400m (11.47) through to the 400m-200m split (11.43) but he posted the fastest last 200m of 11.46 to get him home. The best last 600m of the race went to Strome, whose 33.92 represented the only sub-34 final 600m and it suggested she’s close to a win after two excellent runs back from a spell. Perhaps she was left with a bit too much to do off the wide gate but the mare continued to pick up the pace each 200m split from the 1000m culminating in 11.01 from the 400m-200m (best of the race) then knocked up 11.61 her last 200m. 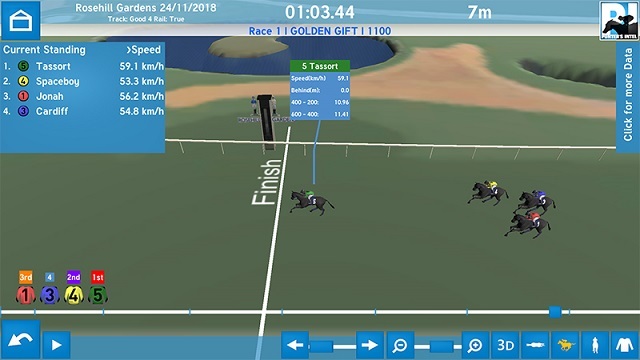 The other 1500m Benchmark 78, won by Organza, was run in slightly faster time thanks to Reflectivity crossing from a wide gate and being pestered by Poet’s Advocate in the middle stages. Despite that, Reflectivity picked up the pace each 200m down to the final furlong but the early effort told and he was run down by Organza due to a 12.13 last 200m. Ombudsman produced another handy effort behind the placings, running 34.59 for his last 600m and was one of only three horses in the race to break 12 seconds for their final 200m. Smart Amelia managed the fastest last 600m of the day of 33.12 as she hurtled home into second behind Demarara in the 1200m mares event. The hard luck story of the race was fourth placed Sweet Scandal, who ran 33.64 for her last 600m while being held up for most of the straight. While the quinella were winding up, Sweet Scandal ran 11.02 between the 400m-200m and 11.08 home, just 0.07 slower than Smart Amelia who had all the momentum. Don’t miss Punters Intel with Brad Davidson, Brad Grey and Gerard Middleton at 7pm Tuesday on Sky Thoroughbred Central.